Crack the Code: Learn to Write Consistently Again | Writing & Book Coach | Marla Beck, M.F.A. I just got off the phone with a fascinating and motivated writer, a woman who confessed to me with shame that she must just be “too lazy” to write consistently. You see, for years, she’s struggled to create a regular writing habit. It’s not that this writer doesn’t have a bit of time to devote to writing each week. (She does.) It’s not that she lacks decent productivity skills (she does). ✓ She’s even found an accountability partner! This writer is doing all the right things to write consistently. So why is she so miserable? Why isn’t she writing consistently? Why is she so uncomfortable at family gatherings, hoping desperately that no one asks about her writing projects? Why is she consumed with secret envy every time someone publishes a piece she knows she could have written? Why does she feel like a failure with her writing…when so many areas of her life are solidly successful? This writer is trying to solve her writing problem with an incomplete arsenal of tools. You see, to truly solve your writing problem, you have to widen your focus. You have to learn to perceive your writing aspirations, challenges and habits in a whole new way. You have to draft a simple, highly individualized plan to get you started writing and on-track to publish what matters most. You have to learn to write again — with ease, agility and joy. 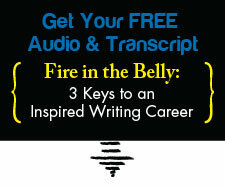 I’ve seen this powerful, three-pronged approach consistently and repeatedly change writers’ lives! ✓ You’ll no longer struggle to find time to write. ✓ You’ll know exactly what to work on when — releasing all the anxiety, tension and struggle that drains your productivity and focus. ✓ You’ll reclaim your integrity. Your power. Your creativity. Your joy. I can help you get there. FAST. All you need to do is reach out to me here, and tell me about your writing challenges and goals. If we seem like a match, I’ll invite you onto a complementary call with me so you can learn more and we can explore working together. How will my life and writing be different when I enjoy my writing again? When I’ve got clear goals and an over-arching path to achieve writing success that matters? You just need to crack the code to writing consistently. If you’re ready to leave your writing struggles behind, get in touch. I’m ready to help you solve this problem quickly and completely. Previous post: Day Job Getting in the Way of Your Writing?